When redecorating your home the lights you select can make a significant impact. Choosing the right light fixtures can make a room look more impressive. For example, hanging a unique pendant light or chandelier can spruce up a foyer or entryway. The right type of lighting can make a space more functional. Understanding the types of lighting can help you select the right fixtures for your Phoenix home. Layering multiple kinds can create a more useful space. Accent. These are meant to highlight specific features in your home. For example, spotlights can draw attention to artwork or a beautiful fountain. Ambient. The general lighting in a room is referred to as ambient lighting. It provides a soft glow and can be found in most rooms of your home. Examples include a wall sconce in a hallway, recessed lights in a living room, or pendant lights in a kitchen. Decorative. This type of lighting is one way to accessorize a room. Depending on the style of your home these decorative lights may be sleek and modern or feature ornate designs. Their purpose is to add some light, but mainly to add beauty or visual interest to a room. Task. If you want to illuminate a specific area of a room task lighting can help. This type of light directs attention where it is aimed. It provides you with light to do specific activities. For example, bathroom vanity fixtures shine light downward to provide sufficient light for getting ready or putting on makeup. Choosing light fixtures starts with selecting the right type of lighting. Consider the purpose and the effect you want to create. Is there a piece of art that you want to highlight in your living room? Choose accent lighting that will illuminate this feature. Is your hallway a long, dark alley leading to the back of your home? A few strategically placed wall sconces could add ambient lighting to create a soft glow in the area. Is your living room looking outdated, but you aren’t ready to buy new furniture to change the look? Add a few decorative lamps to improve visual interest without breaking the bank. Do you need better lighting while preparing food in your kitchen? Choose under cabinet task lighting that shines brightly on the countertops below. Depending on the look you want to create you can choose subtle or decorative ambient light fixtures. 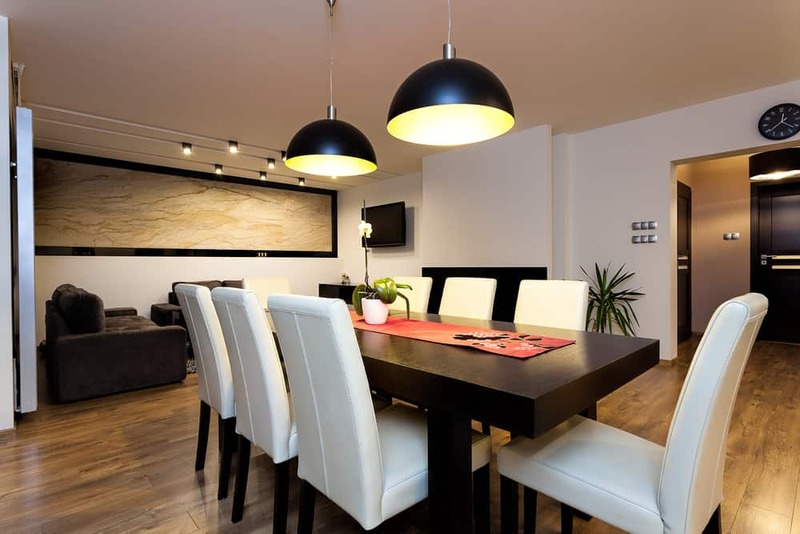 For example, LED track lighting can keep a modern design looking sleek. On the other hand, a chandelier with fine details may fit well in a home with a classic design. Working with a professional can help you narrow down the type of lighting that you need. This can help limit your light fixture options. When you’re selecting light fixtures for your home there are a few things to consider. Convenience. Avoid choosing lights that end up being too much work to maintain. A chandelier with dozens of crystals to polish may be more work than it’s worth. Height. Your space needs to remain functional. A pendant light that hangs too low over your kitchen island will be nothing but trouble if you hit your head every time you prepare dinner. Size. Choose lights that are an appropriate size. For example, don’t choose a standard size ceiling fan when you have a large living room with high ceilings. The fixture you select will need to provide enough light for your space. After you’ve selected the right light fixtures for your home it’s important to make sure they’re installed correctly. Using a professional electrician can help decrease the risk of electrical problems during and after installation. Are you in the process of redecorating your Phoenix home? Contact Turn It On Electric for assistance with all of your lighting needs.